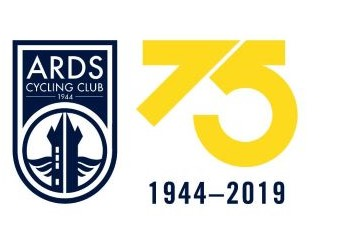 All members should have received an email by now giving details of our 75th Anniversary weekend away to Warrenpoint at the start of May. This is a great opportunity to explore some excellent cycling territory, while getting to know you club mates better. Sign up quickly as places are limited. 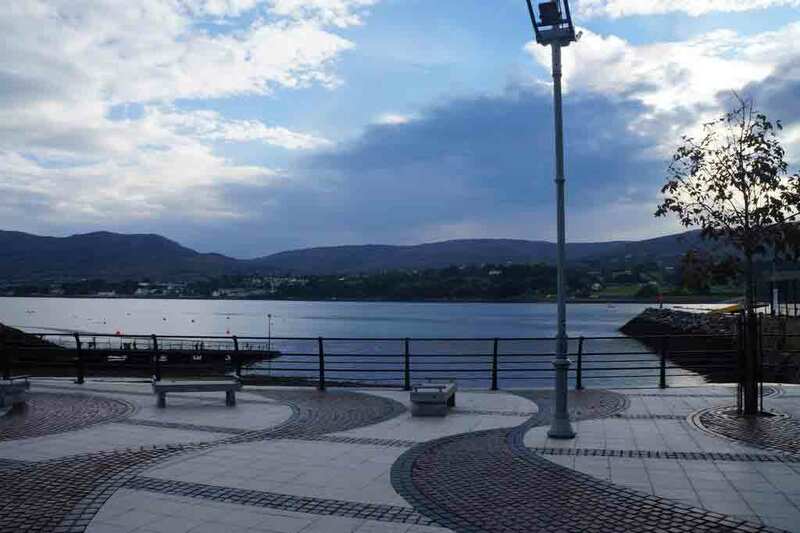 Some folk will undoubtedly choose to ride down, and there are scenic routes round the coast through Newcastle, Annalong and Kilkeel, or more challenging alternatives through the Mournes. 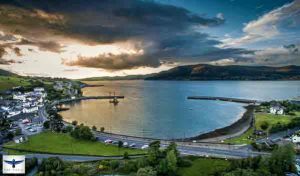 And once in Warrenpoint you’ll be spoilt for choice. In addition to the delights of south Down, there is also the Greencastle to Greenore ferry which gives you access to the Cooley peninsula. The pretty village of Carlingford is just a few miles away, and beyond it lie classic cycling climbs like The Windy Gap (known locally as Long Woman’s Grave (1), and a regular feature in races like the Newry 3-day and the Ras), and the ironically christened “Mary Robinson road” (2) up to the transmitter at the top of Black Mountain. Complete your ride via Newry and the pleasant (i.e. flat) routes along the ship canal. 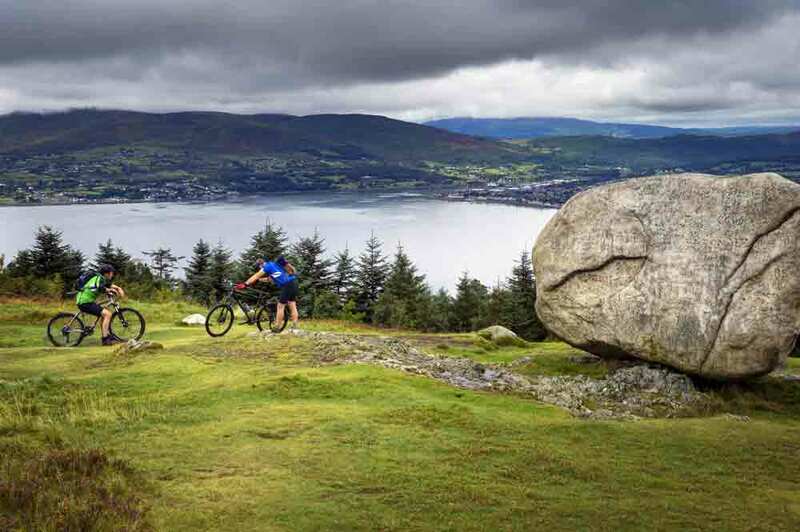 There are also great mountain biking routes, both in the MTB Centre in Rostrevor, and in the Cooleys (Ravensdale Forest and Slieve Foye have both been used for Irish Championships). And if you’ve energy left after all that, what about a quick spin up Cloguhmore Stone? Turn into Kilbroney Forest park (entrance just south east of Rostrevor), and follow the signs. The ride to the carpark is horrifically steep – when this was used as a stage finish in the Tour of Ulster, many riders ended up walking. 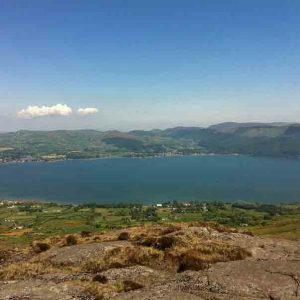 From the carpark, it is just 600m (horizontally, not vertically) to the erratic stone itself – well worth it for the views over Carlingford Lough. What are you waiting for – sign up today, and get planning! Cloughmore stone, and the view across Carlingford Lough to the Cooley peninsula. And a couple of MTBers. (1) One version of the legend has it that a rich nobleman wanted to impress his Spanish maiden. He took her to the Windy Gap, and promised to give her all the land she could see if she would marry him. Unfortunately the cloud blew in, and she could barely see the feet in front of her. She was so shocked, she collapsed and died, falling into the bog at the top of the pass.